These Lasagna Roll Ups not only look incredible but taste incredible. There’s served in individual portions and are great for freezing too. Make lasagna this way and you’ll never go back to sloppy lasagna squares again. Perfect comfort food for the whole family! This is one of my favorite recipes! It’s one that I love enough that I’ll serve it to company. I love that both young and old alike always enjoy them and I also love that they reheat so well. There aren’t many foods that I like just as much when they are rewarmed the second or third day around. Another great thing about these is that you can prepare the full recipe then freeze half and bake them later on. 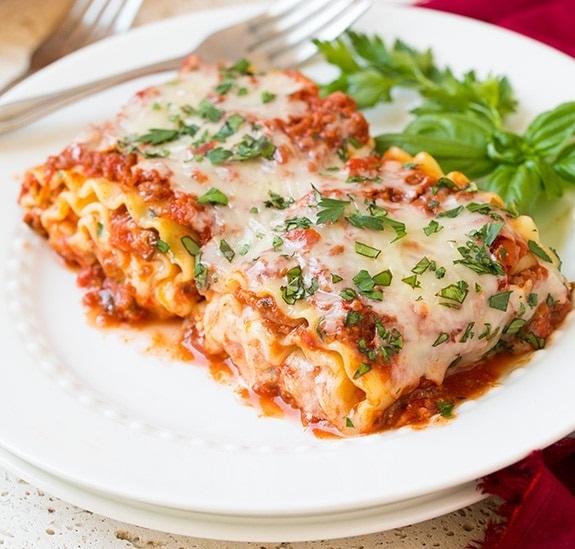 The first time you make these they may seem pretty labor intensive, like just about any lasagna, but once you’ve made them a few times it will start to go pretty quick. These roll ups are just total delicious comfort food, so good you may likely add them to your dinner rotation! One great thing about making these roll-up style instead of like a layered lasagna is that they don’t seem like too much of a splurge because they can help with portion control. But who am I kidding, I always find myself plating a second one because they are totally irresistible! But if you are better with self-restraint then I the portion control thing might mean something to you here :). I love that they are little rolled up individual lasagnas, things are always more fun when they come in individual servings, right? Takes 70 min , serves 12.